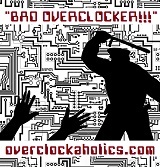 Overclockaholics Forums » Hardware Section » Soundcards » Suggestions for new surround for pc? Z5500 control pod finally bit the dust after 10+ years of service. Any suggestions? Maybe some 7.1 action? Peaked at that one for a bit. Bluetooth woulda been a nice feature to add in there. May end up going with a Home Theater reciever but need to do some research on DTS/DD XYZ decoding first. And also the possibility of a 7.1 setup. Also, gonna see if this brings the old 5500 back to life. I'm using a Yamaha surround sound receiver via I.R. output from my motherboard and Martin Logan speakers. Totally rocks the house man. Ferengi rule of acquisition #8: " Small print leads to large risk. " i.r for the remote or signal? 5.1? Had a senior moment there. Not i.r it's the optical output. All times are GMT -10. The time now is 06:54 AM.